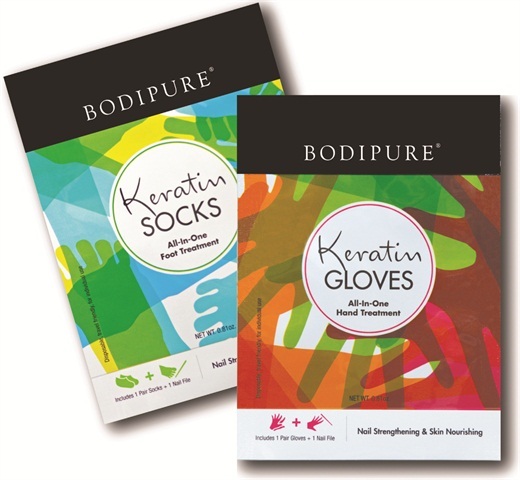 Keratin Gloves and Socks are waterless manicure and pedicure treatments from Bodipure formulated with 100% vegetable active ingredients derived from renewable sources. This self-activating product contains an intensive, antiseptic, and fortifying emulsion to strengthen nails, soften cuticles, and moisturize the hands and feet. Ingredients include keratin, urea, vitamin E, Lipex PreAct (a UV protectant), and copaiba oil. According to Bodipure, waterless mani/pedi methods improve polish application for longer-lasting wear by eliminating soaking, which expands the porous nail bed and increases vulnerability for bacterial transmission. 1. Remove polish and file your client’s nails. 2. Warm the keratin gloves by placing them in a towel warmer. 3. Slip both gloves onto your client’s hands. 4. Gently massage the emulsion inside the gloves all around the nails, paying special attention to the cuticles. 5. Push the gloves back to free the fingertips and then clean and push back the cuticles. There’s no need for any water or cuticle oil during this step. 6. Remove the gloves and massage the hands and forearms with the remaining emulsion. 7. Dampen a paper towel with nail cleanser or alcohol to remove any excess emulsion from the nail plates before applying base coat and polish. For a video demonstration of Bodipure’s Keratin Gloves & Socks, visit www.nailsmag.com/nailstv.